Just Parts is Australia’s spare parts supermarket. From rare and specialist parts dealers through to the largest number of private parts sellers, if you’re a vehicle enthusiast then this is a subscription you can’t afford to be without.Whether you’re buying, selling or just plain dreaming, you’ll find it in Just Parts. 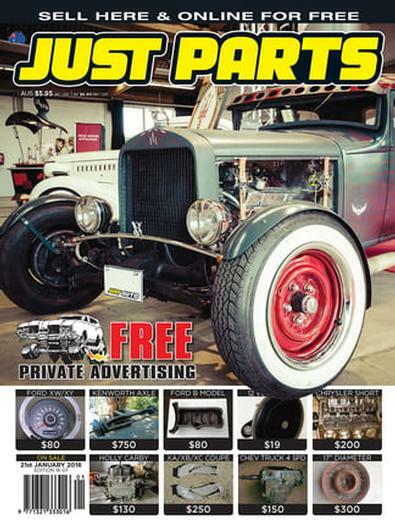 Have Australia’s only dedicated parts magazine conveniently delivered and take the hassle out of tracking down parts.NOTE: JUST MAGAZINES DO NOT guarantee early (ie. before the newsagents on-sale date) delivery of any JUST MAGAZINES publication. While JUST MAGAZINES does endeavour to get all subscriptions to recipients on the published on-sale date of each relevant publication, we cannot allow for delays or any other problems with the postal system. JUST MAGAZINES will accept no responsibility for lost, late or misdirected magazines sent through the postal system.